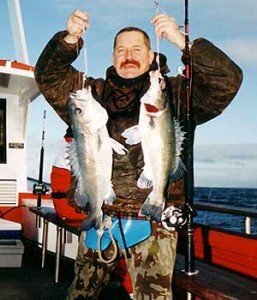 The author with a brace of school groper taken from deep water over the Pegasus Canyon approximately 27 nautical miles east of Banks Peninsula. When groper fishing in very deep water 100 metres down, or even deeper, it takes quite a bit of effort to lower and raise your baited hooks on rod and reel. To get your gear down you need heavy sinkers and robust tackle to cope with the potentially big fish being targeted. Also it can take a long time to wind up from these depths. It is therefore important to make your time on the water as productive as possible. This is particularly true on a rocking boat in rough conditions – where you don’t want to be messing about with your gear. In a charter situation it is essential to make the most of your fishing time. Depending on sea conditions the crew may only get a few drops over a mark. It also has to be said that most skippers will allow only a few groper to come aboard before moving on! You need to know that your terminal tackle won’t let you down. Good preparation before you get out on the water is the secret to success. As mentioned, you need strong terminal tackle that can lift big fish off the bottom. If you get a big groper on both droppers it stands to reason that the mono, crimps, knots, and hooks must be able to take the strain. You also need a rig that won’t tangle in the water or when on the deck. Crimping pliers are essential to apply sufficient pressure to the crimps. Also pictured: Luminescent beads, lumo tube, armour spring, crimp sleeves, and lumo elbows to prevent chaffing at the top loop. It takes at heavy sinker to pull your baited hooks quickly down to the bottom. This usually means at least 600 grams (21oz) sinkers that have a “tear drop” shape, slim in profile, and fatter and heavier at the bottom. 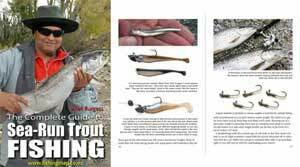 There is a great deal of water resistance working against your gear, both when being lowered and when being raised, whether you have a fish on or not. Heavier sinkers help when there is a bit of current running. I prefer 800 grams (28oz) models. However, particularly when fishing with monofilament mainline, it is quite normal to never actually feel the sinker hit the bottom. The only indication you may have of a hooked fish is when you take up the heaps of slack in the line and you eventually feel a very heavy weight at the bottom. It is also quite normal to think you’ve snagged the bottom as there may be virtually no feel or sense that you have hooked a fish. This is a result of line stretch in mono that can make the line as much as 30 percent longer. The boat will not be anchored when fishing at these depths. You will be drift fishing. Depending on wind and tide the vessel can be moving quite quickly across a mark. Without any point of land reference this movement is not easily perceived on deck. The boat could be moving at 8 knots or even faster. For this reason the best technique is to lower your gear quickly to the bottom – a much easier task with the new, low stretch, super lines like Spider Wire – then take a metre or two back on to the reel. This is done in an effort to reduce snagging the bottom over fowl ground. It can be hilarious when one of the crew becomes snagged and thinks he has a fish on. A great deal of puffing and excitement, together with vigorous pumping of the rod, and winding of the reel handle, eventually leads to the inevitable realization that there is no fish on the line. It can some times take ten minutes or more to establish that this is so. This can easily happen when the boat is drifting back up a slope on the sea floor. The water under the vessel is becoming shallower and the sinker can crash its way up the slope, allowing line to be retrieved and so giving the impression of gaining line on a monster groper! Top loop of deep sea groper rig reinforced with armour spring. Sometimes when fishing fowl ground the trace, with its droppers and sinker can become stuck fast to the bottom. This is an interesting problem to consider, and one best considered in advance. It is a problem made worse when fishing the new super lines, particularly if fishing 80 lb or heavier. This arrangement may be almost impossible to brake-off at the knot if you get snagged. If you use 400 lb line for your trace and droppers you will have to tie-off to a bollard and let the launch do the work. However the line could well snap at the wrong end – expensive if using braided Kevlar super line. The sinker is the most likely part to get stuck over rocky ground. For this reason always attach the sinker to the bottom of your paternoster rig with a sacrificial link. Instead of passing the bottom loop through the sinker, attach it with a short length of 40 lb mono. I like to use a cheap snap swivel without bending over the locking tabs. This then becomes a weak point and causes the sinker only to be lost if you get snagged. Overall the trace should be about 1.5 metres long, tied from 400 lb mono, and have droppers about 30cm in length. The two droppers should be spaced so they can’t touch one another and become tangled. Make up half a dozen or so at home, just in case, and store in zip-lock plastic bags. If you do get a bust-off you can have another on within seconds and be fishing again. You can make groper rigs without using crimps. Just create droppers with blood loops, and a loop at the top and bottom with a nail knot. Crimps make the job a good deal quicker and easier. 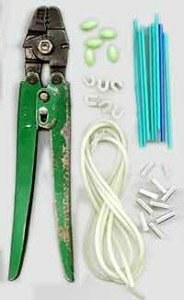 But you must have the correct size crimps for the mono and a proper pair of crimping pliers to do the job right. Create a small loop at the top of the trace for attaching your mainline. Most anglers wisely protect this top loop from chaffing with stainless steel armour spring sold in tackle stores for the purpose. Always use a quality Sampo coast lock swivel on your reel line for attaching the groper trace. ottom fishing in deep water for groper is really blind fishing without any feel of the fish hitting the bait or swimming around on the line. The new super lines have improved “feel” considerably. But this type of very deepwater fishing lacks appeal for many anglers. But it nevertheless requires thought and preparation if your fishing time is to be as productive as possible.